Scott Fibertouch rods have been so popular with our guides and customers over the decades that nothing about the new F Series feels surprising. We believe these are some of the finest fly rods on the market of any material and at any price. Most striking is the look of the new F Series, an orange dye-impregnated glass that is visibly original but references the fiberglass rods of the 1970s. Except for the action style, nothing about these rods is “old fashioned.” The blanks are constructed from elastic “E Glass” with the same high-tech prepreg resin used in Scott Radian and Meridian fly rods. The new resin, combined with the improved Scott Internal Ferrule and clever new blank tapers, results in rods that are notably lighter than their predecessors. New F Series rods are more “intuitive” in both action and accuracy. They bend deeper but recover faster than the F2 Series. This may seem impossible, but you’ll feel it in every cast. These rods track much straighter with less bounce, so your fly will land right in those tea cups under willows and behind boulders. Scott has also upgraded the hardware, utilizing a slide band over cork reel seat on the F 583-4 and F 622-4, and an uplocking aluminum over cork seat on larger models. The grip really completes these rods, a reduced Trout Western of Scott’s own design. The cork is Flor quality, the finest available, and Scott finishes the F Series with expensive titanium SiC stripping guides, Snake Universal guides, measuring wraps, alignment dots and CNC milled reel seats. In a word, they are exquisite. “The Wee One” is a house favorite. We fished an advanced prototype of this model all spring on the creek tributaries of the Dolores and San Miguel. Ultra-short rods work well in tight quarters, but most don’t “cast” a fly line in the conventional sense. Thanks to its highly refined taper, the F 583-4 flexes evenly and casts with a normal casting stroke. The rod bends almost to the cork but forms nice casting loops from 10’-30’. It will actually cast much farther, but the angler has limited ability to mend line or set the hook beyond 30’. Playing fish makes me giggle, but the leverage provided by this short rod allows the angler to dictate the fight with surprising command. This is my favorite kind of toy. Fly lines: Choose a line that is true to line weight, whether weight forward or double taper. I prefer a DT on this little rod, of which both the SA Mastery DT2F and Rio Trout LT DT2F are great choices. This is my favorite rod in the series. It casts with elegance and ease, with unmatched connectivity. Fiberglass rods tend to throw lumpy loops, but the F 622-4 is so perfectly tuned to its line weight that it overcomes this predilection with parallel loops rivaling those of any graphite fly rod. Only six inches longer than the F 583-4, the F 622-4 maintains the feeling of surreal lightness while offering substantially more range in all casting and fishing techniques. After casting the F 622-4 for the first time, the word “lovely” came to mind. Fly lines: SA Mastery DT2F, Rio Trout LT DT2F, SA Trout Taper WF2F. Over the decades, every Fibertouch 6 ½’ 3-weight has been a winner. Several of our staff rate this rod “best in series.” For me, it is a close second to the F 662-4. The F 663-4 is superior to its predecessor in every regard: lightness, flex profile, feeling, accuracy and fish playing ability. The F2 653-4 was my favorite rod in that series. I unconditionally recommend this new model for all-around small stream and beaver pond fishing. The greatest improvement is in accuracy and smoothness. 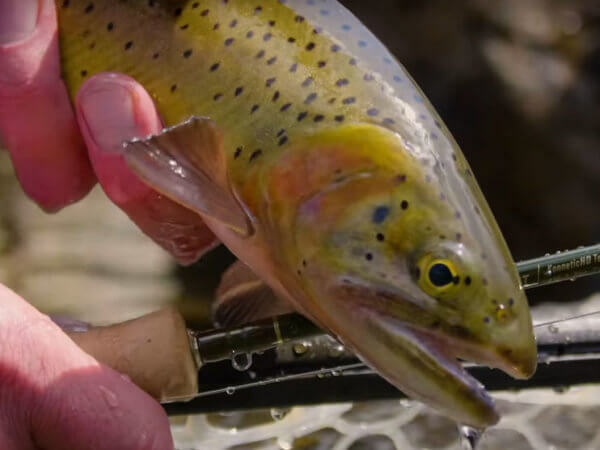 Scott rarely introduces a new fly rod if the casting qualities are not clearly superior. Bartschi redistributed the mass and stiffness in this model to smooth it out magnificently. I love the length and overall utility of this rod, but it is not quite as light and sweet casting as the F 663-4. The 5-piece configuration is extremely attractive for backpacking. On the whole, this model is a marvel of design and testament to the efficacy of Scott’s internal ferrule. With four ferrules in a 7’2” rod, however, it is inevitable that the rod would be a bit heavier than others in the series. I unconditionally recommend the F 723-5 for a backpacking rod. If not for that specific purpose, I would personally opt for the F 663-4. Fly lines: This rod is among the slowest in the series, so choose a line that is true-to-line-weight, like the SA Trout Taper, SA Mastery DT3F or the Rio Trout LT DT3F. In my opinion, Double Taper lines bring the best out of this rod. Perhaps the most improved model in the series, the F 724-4 is shorter and much lighter than its predecessor. In my opinion, 7’ 2” is a perfect length for a fiberglass 4-weight, long enough to offer reasonable casting range and tremendous roll casting ability, but notably lighter in swing weight than the 7’7” glass models of the past. Like all rods in the F Series, the F 724-4 is truly “slow action.” While the casting cadence is relaxed, the tip of the rod drives through each cast with conviction, generating nice line speed and turning over wind-resistant flies more capably than lighter rods in the series. This model is ideal for throwing hoppers and hopper-dropper rigs. Fly Lines: This model will handle a wide range of lines, including those rating high in the 4-weight line class, like the Rio Gold or SA MPX. For casting dry flies, I prefer the gentle tapers of the SA Trout Taper and Rio Perception, but each angler should choose a line based upon fishing technique, rather than “what the rod can handle.” Like the other rods in this series, Double Tapers fish great on this rod.